Flushed with Rosy Colour: Five dollar limit on gifts a Great Idea! There are so many cute little gift ideas under $5, especially for babies and young children, there's no need for the gift giving ritual to be excessively expensive! Now I'm a mum I'm making more of an effort with Christmas this year. Granted I could make more of an effort than I have, but this year I'm just warming up! Next year I'll be even more organised! Today I brought in our living Christmas tree and decorated it, it does look a little small, scrawny and sad, but not as much as last year! 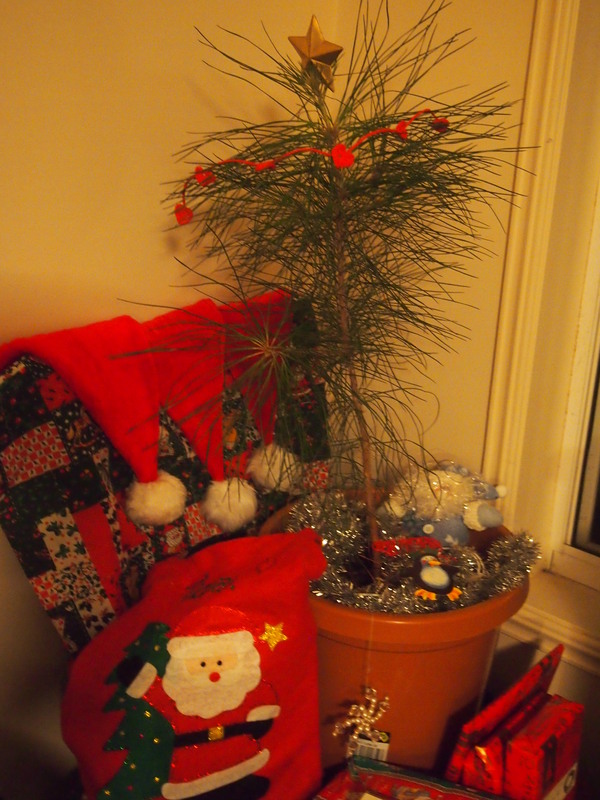 And next year, if all goes well, the Christmas tree should look better and bigger after a year of growth. I couldn't put much decoration on it at all, it started to lean over so much, so I could only put one small star on it, and the love heart garland I made last year. All the gifts I'm giving this year, or should I say Thomas is giving this year, cost $5 or less. As much as I'm actually not that keen on Christmas, I don't want to be the mean spirited parent who makes my son miss out on something that is an undeniably big part of our culture. So Thomas is giving everyone a small gift this year, especially considering all the generous gifts he got from them when he was born! But I do wish others were not so extravagant with their gifts, because we can't afford to reciprocate. But there are so many cute things you can give for just $5 or less! Some ideas for this year include books and a toy car I found on special for the kids, gluten free chocolate biscuits for my coeliac brother and framed photos of Thomas for the grandparents. I prefer to buy children's books second hand from the charity stores, as they usually only cost 50c. Sometimes I can pay $2 for a second hand book, which is still a lot cheaper than most new ones, but I found some nice ones for $4 at the department store.